AEDREON CORP is proud to announce that we have added full multi-PLP support for DVB-C2 and DVB-T2 to our SDK. This enables our customers to create their own multi-PLP C2/T2 signal generators, automated test environments, without having to deal with the complexities of DVB-T2 or DVB-C2. The ATCAPI library provides easy access to the devices through object oriented environment. The ATCAPI multi-PLP extensions add full support for the PLP concept as used in DVB's second generation transmission standards DVB-T2 and DVB-C2. The PLP allows the transmission of several independent logical data streams on a single RF channel. Each stream is carried in an individual PLP. One or more PLPs can be combined into a group of PLPs, typically containing one common PLP and multiple data PLPs. The common PLP carries the common SI data and each data PLP carries a partial Transport Stream containing one service. The ATCAPI multi-PLP extensions contain not only functions for transmitting data via individual PLPs, but also a Transport Stream splitter. The Transport Stream splitter performs all required PSI/SI processing to split a single Transport Stream into multiple data PLPs and a common PLP. Since the launch of the new Intel i7 processor, it is now possible to achieve real-time advanced video and audio encoding entirely in software, even AVC encoding in HD. 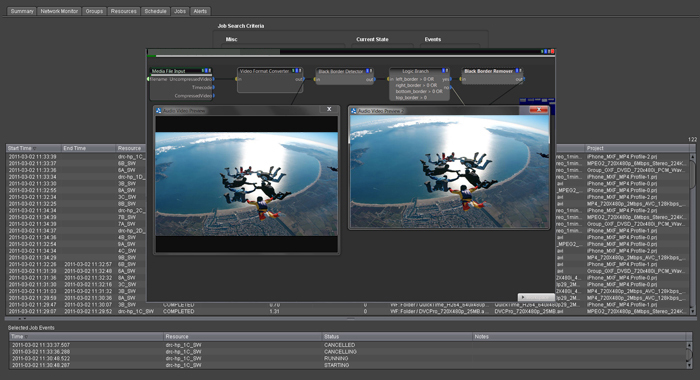 AEDREON CORP takes this opportunity to launch Axcode, a new software product for cost-effective real-time encoding of base-band video and audio such as HD-SDI. Axcode targets not only the local broadcasting segment, where cost-effective encoding. Typical applications include company-internal broadcasting, digital signage and local-area mobile TV. But also targets professionals whom seeks a powerful yet simple solution in video processing and transcoding digital RAW contents. Another application where Axcode comes in handy is user-friendly and flexible generation of compressed video within R&D facilities. We are glad to announce the release of our new ATC-716PE, which supports a long list of modulation options including the latest versions of DVB-C2 and DVB-T2. Even a fully-featured channel-simulator is available as an Licensed option. The RF output generates frequencies from 47MHz up to 1GHz, while the output level is programmable between -45dBm and -15dBm. The MER is approximately 40dB. This device is a marvel of hardware and software technology. The RF output is generated entirely in the digital domain, so that no upconverter is required. Please check the product page for more information. AEDREON CORP is proud to introduce the Axplex, a real-time re-multiplexer of live MPEG-2 Transport Streams. This professional-grade application runs on a standard- or industrial PC in conjunction with any mix of AEDREON's input and output adapters. Services and service components from any input can be re-multiplexed to any output. The multiplexing application is highly scalable up to 8 input ports, 4 output ports and 2 file players. All current models of adapters are supported, and all kinds of conversions are supported as well. The application has integrated Transport-Stream file players for inserting local content from disk into live streams. The players can be manually controlled from the GUI and automatically from a play list. The GUI of the Axplex displays information about the services, service components and bitrates present in the input and output Transport Streams. Flexible configuration allows the user to specify the newly created Transport Stream, including PID-remapping, PID-filtering, service-remapping, descriptor filtering and addition, generation and insertion of PSI/SI tables and more. The Axplex is the ideal application for many scenarios requiring multiplexing. In head ends of all sizes the application is perfectly suited for generating new Transport Streams from existing live streams. In the lab one can generate fully customised Transport Streams from files, in any mixture with live feeds. AEDREON CORP introduces Axcap, a new advanced capturing and recording solution. Axcap is most useful for continuous logging of broadcasted signals, HE system monitoring / troubleshooting and field STB debugging. - In Multiple-File mode the incoming Transport Stream is automatically divided over multiple files. The operator can select auto-deletion of old files based on time-to-keep or on a maximum number of files. Filenames are time-stamped for convenient post-processing. - In Loop-Recording mode the incoming stream is recorded in a loop into a single file. When recording is stopped, the application reconstructs the original sequence of packets. - A merge tool for concatenating TS files is included. - Alarm logging (Sync Loss, Buffer Overflow, ...) and hard-disk overflow monitoring. - External storage units are supported to permit cost effective integration for small operators and handling of very large files. The ATC-501P is a true multi-standard modulator with an integrated fully-agile VHF/UHF upconverter (47-862 MHz). Two outputs are supported: a main output 50-Ohms BNC with programmable attenuator (30dB range) and a 75-Ohms F-type monitoring output. A full-function bi-directional ASI port is available to read a Transport Stream, or act as an independent ASI port. Out of the box, the ATC-501P supports ATSC, DVB-C, DVB-H, DVB-T and QAM A/B/C. The other modes, DTMB and ISDB-T/ISDTV are software/firmware options via Licensing that can be purchased as a bundle or as an upgrade later .